Recently, incidences of breast cancer are increasing and it has become a leading cause of cancer related deaths of women globally. Though pharmaceutical and biotechnology industries are developing, and researchers are working to find a better treatment of breast cancer patients to improve the effectiveness of current therapy, the survival rate is very low. A lot of research is going on based on lipid particulate systems which has versatile applications for the treatment of life-threatening diseases such as breast cancer. Out of various lipid particulate systems, liposomes have been studied and explored widely as they have many applications such as improving solubility of antitumor drugs, reduces the side effects, long circulation in blood, possibility of passive and active targeting to tumor cells. Liposomal system is most popular because of its biocompatibility, capability to encapsulate hydrophilic as well as hydrophobic drugs, ease of surface modification and wide range of applications. Thus, a thorough research is ongoing for upgradation of liposomes as multipotential carriers and its effective therapeutic. Therefore, this review article includes the recent development and techniques of liposomal nano formulations drug delivery system. This review majorly focuses on the breast cancer and its therapy, current challenges in experimental and clinical studies in liposomal formulations. Cancer as on today is one of the most difficult health related problem worldwide for men as well as women. Besides availability of understanding the molecular mechanisms of cancer, chemotherapeutic drugs and radiotherapy as well as surgical treatment options, current treatment strategies face many problems and a treatment does not turn out successful to eradicate cancer in patients. The major obstacles of current scenario for cancer therapy are, difficulty in early detection, off target effects of chemotherapy, relapse and multi drug resistance. Researchers are working on to develop nanoformulations drug delivery systems such as polymeric nanoparticles (Patel et al., 2018), targeted protein nanoparticles (Yewale et al., 2018), liposomes as well as gene therapy (P. Bhatt, Khatri, Kumar, Baradia, & Misra, 2015); (Patil et al., 2016) options are also being explored for selective targeting of drug, to reduces side effects and improve effectiveness of treatment in cancer therapy. Out of various forms of cancers, breast cancer is the leading cause of death among the women globally and a second most worldwide spread cancer. This cancer is day by day growing in the women and highly widespread which is reported by international agency for cancer research in the year of 2015. One woman out of eight has been diagnosed having breast cancer in united states in 2016. Therefore, in women death by the breast cancer is noted second foremost causes of death. The risk factors of the breast cancer are reproductive factors, lifestyle factors, family history, radiation exposure and changes in BCRA1, TP53 and BCRA2. The breast cancer treatments are radiotherapy, hormone therapy, chemotherapy, biological therapy and surgery (Hortobagyi, 1998). However, these treatments success on breast cancer depends on stages of cancer in patient (Elhazzat J, 2010); (Priyanka Bhatt & Narvekar, 2018). Moreover, chemotherapeutic is also one of the effective treatments but these treatments have several limitations because of its adverse effect on other healthy cells of body. Failures and ineffective results in chemotherapy mainly is because of multi drug resistance (Dhankhar et al., 2010). Additionally, chemotherapeutic agent’s nonselective cytotoxic activity on healthy cells, chemotherapeutics physicochemical property limitations in given dosage are other challenges in this treatment (J. W. Park, 2002). To overcome such problems and side effects, the novel liposomal nanodrug delivery system is one of the best suggested solution (Elhazzat J, 2010). These formulations are one of the most effective and efficient technique among others such as solid lipid nanoparticles, lipid nanoemulsions, nanostructured lipid carriers and nanosuspensions (Puri et al., 2009). In recent technological development in targeted drug delivery system by the liposomes nano formulations are the most popular and common for breast cancer treatment (Koning & Storm, 2003). Also observing the last three decades the liposomes-based delivery techniques have been growing because of unique characteristics which includes low toxicity, lack of immune system activation, biocompatibility, bio-degradability and therapeutically active agents (Voinea & Simionescu, 2002). Moreover, it can incorporate hydrophilic as well as hydrophobic drugs as shown in figure1. It has been noticed that liposomes have good therapeutic potential to carry payload and delivery it to the target sites. These tremendous potential leads researcher for clinical trials to developed the liposomal based nano formulation drug delivery for breast cancer therapy (Voinea & Simionescu, 2002). The first time liposomal based targeting drug delivery system was introduced as magic bullet in 1906 (Strebhardt & Ullrich, 2008). Henceforth, pharmacodynamic and kinetic profiles can be improved by sustain release of incorporated drugs to lower toxicity in comparison of free drug. There are several key points which reflects therapeutic potential of liposome such as intracellular delivery followed by triggered and organelle-specific targeting of therapeutic payloads to tumor cells byactively targeting (Sawant & Torchilin, 2010); (Torchilin, 2005). This review is exploring the recent development and employed strategies to enhance present liposomal techniques in breast cancer therapy. Figure 1. Hydrophilic and hydrophobic drugs encapsulated within a PEGylated liposome (Voinea & Simionescu, 2002). There are many types of diagnostics methods which are used to diagnose breast cancer. These imaging tests methods include pelvic examination by Magnetic Resonance Imaging, Computerized tomography scans, serum biomarkers detection of Cancer Antigen 125 and transvaginal ultrasound or ultrasonography etc. These technics of diagnostics is not reliable for first stage of breast cancer (Fishman et al., 2005). Hence, it is difficult to detect early stage cancer. Currently for the treatment of breast cancer, chemotherapy and cyto-reductive surgery are mostly used. Taxol derivatives in combination with platinum compounds in standard chemotherapeutic for newly diagnosed breast cancer (Marchetti et al., 2010). In chemotherapy, risk of recurrence, poor quality patient life, drug resistance are the main barriers due to such problems chemotherapy treatment is clinically handicapped. Moreover, neurotoxicity, nephrotoxicity, ototoxicity and nausea are the adverse effects and can be vary depending on the cancer stage (Johnson, Ozols, & Hamilton, 1993). Another challenge to breast cancer treatment by chemotherapy is Multi drug resistance. The drug efflux by P-gp is increased than drug in flux in tumor milieu. Detoxification, DNA starts to repair, modification in BCL2 and P53 expression are the recommended mechanism for multi drug resistance (Dinarvand et al., 2013); (Thomas & Coley, 2003); (Zhou et al., 2012). In more than 40% breast cancer it is observed that the P-gp over expression affects the drug concentration in tumor therefore the chemotherapy treatment is failed (Fishman et al., 2005). The drug delivery system is the important factor to overcome P-gp efflux effect by ion-pair formation and endocytosis. It has been observed that surface modification of liposomes with different peptides, antibodies and polymer may improve P-gp potentials (Seelig & Gerebtzoff, 2006). Liposome is defined as lipid vesicle with at least one lipid bilayers. The lipid vesicle consists of aqueous core with one or more phospholipid bilayers. The phospholipid bilayers are consisting of hydrophobic drugs and aqueous compartment incorporates hydrophilic drugs. Therefore, these kinds of vehicles are used for delivering hydrophobic and hydrophilic drugs (Lao et al., 2013) (Kulkarni PR, 2011). The liposome size varies between 0.02 to 5.00 μm. These sizes varies accordingly preparation methods, surfactants and type of phospholipids used (Malam, Loizidou, & Seifalian, 2009). 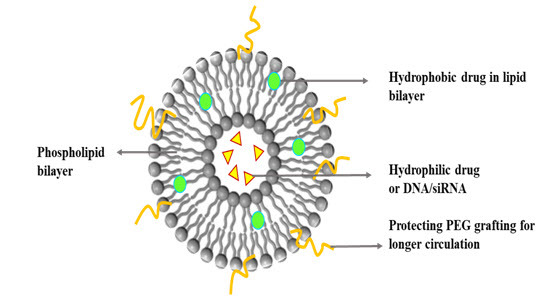 The liposomes have unique characteristics like biodegradability, nontoxicity and biocompatibility therefore it is used in many applications (Allen & Cullis, 2013).The modification in targeted drug delivery system is possible in the liposome hence off-target cytotoxicity can be reduced by targeting them to specific tumor site (Dua J, 2012); (Sharma et al., 2006); (Rivera, 2003). Based on the successful studies and clinical trials some liposomal products are available in the market. As discussed in the above section there are several strategies have been used to resolve the multi drug resistance through liposomal nano delivery system. Liposomes surface modification is one of the appropriate drug delivery methods which can improve the ability of liposomal as drug delivery system. In surface modification polyethylene glycol is used as coating which can open new route in standard chemotherapy system (Priyanka Bhatt et al., 2018). Basically, pegylated liposomes improved the pharmacokinetic and pharmacodynamics parameters because of the long circulating system which increase the accumulation of drug in tumor cell. This is also known as stealth liposomes (A. A. Gabizon, 1994). This system has not only good stability but it can increase the blood circulation time by escaping from reticuloendothelial system (A. Gabizon et al., 1994). One of the study carried out on SN-38 included pegylated nanoliposomes and SN-38 included non-pegylated nanoliposomes and did the comparison. They found the pegylated nanoliposomes drug delivery system has significant results and less effects on the body organs like kidney, spleen and liver etc. compare to non-pegylated (A. A. Gabizon, Shmeeda, & Zalipsky, 2006); (Tandel, Bhatt, Jain, Shahiwala, & Misra, 2018). After clinical trials and experimental studies it has been found that the pegylated liposomes have less side effects and the higher safety. The doxorubicin loaded stealth liposomes compared to conventional liposomes are effective and lower cardiotoxic which can be more beneficial to metastatic breast cancer treatment (Atyabi et al., 2009); (J., 2003). The other formulations are under clinical study and development which are shown in the table 1. Also, some of marketed liposomal products are included in the table1. Table 1. 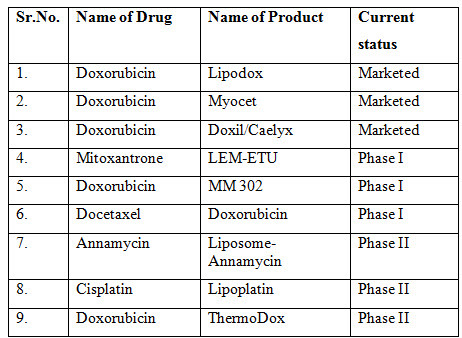 The current marketed products and status of clinical trial liposomes (J., 2003). Recent research and development adopted different strategies for targeting liposome to the tumor site. Here in the following section active and passive targeting strategies of liposomes through has been discussed (Lalani, Bhatt, Rathi, & Misra, 2016). The development of the active targeted liposomes leads to reduction in the off-target effects of conventional chemotherapeutic drug. Surface of such liposomes are decorated with the ligands such as monoclonal antibodies and peptides as well as proteins to specifically target tumor cells (Rom et al., 2014); (Pathak Nandish 2019). It has been observed that the receptors like transferrin, vascular growth endothelial factor receptor, endothelial growth factor receptor and float receptors are overexpressed on the cancer cells (Vhora et al., 2014). The actively targeted liposomes are surface modified to specifically target these receptors to reduce nonspecific effects of chemotherapeutic drug (Priyanka Bhatt, Vhora, et al., 2016). Actively targeted liposomes function in the tumor microenvironment and later on liposomes are taken up by tumor cells (Vhora, Patil, Bhatt, & Misra, 2015). It is very important to prepare the liposomes to target specific protein on cancer cells as affinity of ligands for cell surface receptors, density of overexpressed receptor proteins and ligand properties play a very important role (Egusquiaguirre et al., 2012).